Stalactites are cone-like rock formations that hang on the ceilings of caves. 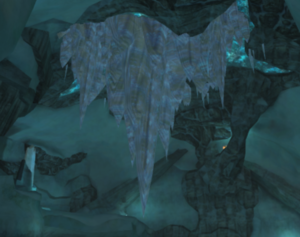 Stalactites appear frequently in the Metroid series, but they only served roles in a puzzle aspect in Metroid Prime. Stalactites are a form of research that can be recorded in Samus Aran's Logbook. However, if she dislodges all of the stalactites she can find and does not scan them beforehand, the scan will become unavailable. Found in Phendrana Drifts and Magmoor Caverns, they are vulnerable to concussive blasts and can be ruptured with a Missile. The resulting instability will cause it to fall down, allowing it to be used as a platform and, occasionally, killing an enemy such as a Magmoor in the process. Stalactites can also be used to impact the area beneath them with significant force. A Missile Expansion trapped beneath the ice in Phendrana's Frost Cave can be obtained by dislodging a Stalactite nearby and fracturing the otherwise impermeable ice. 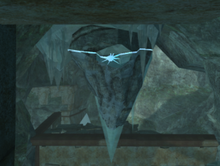 One Stalactite sheathed in ice in Phendrana's Gravity Chamber is made of several types in mineral deposits, including a volcanic rock, that make it incredibly strong against concussive blasts. If Samus introduces extreme heat from the Plasma Beam, however, the formation will collapse, revealing the path to another Missile Expansion. This hanging rock structure appears to have a weak spot near its base. Some stalactites can be dislodged from ceilings, allowing them to be used as platforms to cross otherwise unreachable areas. The ice of this stalactite contains many different types of mineral deposits. One of the minerals detected in the ice structure appears to be a volatile form of volcanic rock. This rock makes the formation incredibly strong against tremors and concussive blasts, but it will become unstable if heat is introduced. This page was last edited on 18 July 2013, at 03:46.